In the event you experience a loss to your home, whether it be by fire, tornado, flood, burglary or other event, having a home inventory list can help ease your situation. Having that peace of mind is invaluable, yet, according to a 2012 study by the National Association of Insurance Commissioners, more than half of Americans do not have a home inventory list. An inventory list will help when filing a claim and provide proof of what you had before the loss. However, in order for your inventory list to be valuable, you’ll want to prepare it correctly, filling in all necessary details, taking photos or videos of items and updating the list annually. Creating a list may seem like a daunting task; we’ve got you covered with these easy-to-follow tips on how to create a home inventory list. Inventory each room in your house (including your garage) and write down all your items. Include all items such as: electronics, furniture, kitchen items, lamps, clothes, pictures, golf clubs, workout equipment, shoes, bikes, lawnmower, snow blower, etc. Take individual pictures or videos of electronics and items that may be associated with a higher value such as furniture, golf clubs, lawnmower, washer, stove, etc. Once your list is created, you’ll want to review it with your independent insurance agent to understand what’s currently covered under your homeowner’s insurance and what you may need additional coverage for. Whether you’re a first-time home buyer beginning to search for homeowners’ insurance, or in the market to find better coverage, the best place to start is with an independent insurance agent. An agent will help identify your unique needs to make sure you have coverage where it’s needed most. A standard homeowners’ policy covers three areas: structure, belongings and liability. We break each of these down for you below so you are better prepared when meeting with your independent agent. 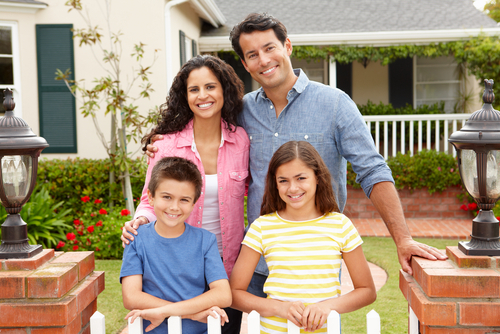 Standard homeowners’ insurance policies cover structure, which includes your physical house. It could also include detached buildings, such as a garage, storage shed, fence or gazebo. Most homeowners’ policies will cover sudden and accidental damage that occurs to your structure due to many different causes. For instance, damage from a hail or wind storm, fire or tornado is typically covered. However, lack of home maintenance is not covered. This can include mold from flooding or leaking pipes, or normal wear and tear to your carpeting, doors and walls. It’s important to note that homeowners’ insurance policies do not cover damage resulting from flooding. Belongings are pretty straightforward. Standard homeowners’ insurance policies cover personal items inside your home or other structures on your property (garage, shed, etc.). This can include furniture, electronics, appliances, clothing, jewelry and tools. Quick tip: you may not realize the total value of all those items until it’s too late. Make sure you create a home inventory to account for all your belongings in case of disaster. Keep in mind, although belongings are covered under a standard homeowners’ policy, you may need to inquire about additional coverage for higher-value items, including jewelry and collector’s items. The last area a standard homeowners’ insurance policy will cover is liability, which covers lawsuits against you for property damage or bodily injury that you or your family members (including pets) cause to other people. Liability also covers you in case someone is injured on your property (other than you or your family members). One additional area to mention in a standard homeowners insurance policy is ALE, which covers claims or your expenses if you can’t live in your home due to a covered loss or damage. For instance, if a house fire happens and you are not able to stay in your home while it’s being repaired, ALE will cover reasonable hotel bills, meals and other costs, up to a specific limit. Although a standard homeowners’ insurance policy covers the areas mentioned above, each policy has limits to what and how much is covered. Connect with your independent agent to identify your specific needs to ensure your home, everything and everyone you love is fully covered. Disclaimer: Coverage's described herein may not be available in all states. Contact your local independent agent for complete details on coverage's and discounts. If the policy coverage descriptions herein conflict with the language in the policy, the language in the policy applies. Businesses face risks every day – from software failure to Mother Nature. Any one of these risks could force a business to close up shop. In fact, nearly 40% of small businesses close after a disaster1 and only 25% of those that close, will reopen. 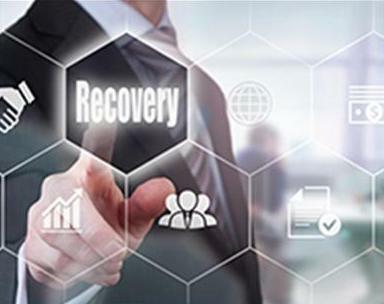 It’s vital that all companies have an effective business disaster recovery plan. If your business does not currently have a plan in place, follow these steps to get started. Determine who from your internal organization will be responsible for helping out when disaster strikes. You’ll likely want your leadership and management teams to play a role in communications to other associates, vendors, customers and media. There’s a power outage this morning at your retail shop caused by a strong windstorm last night. It will take three days for the electric company to fix the problem. You’ll need to determine who is responsible for communicating the situation, timing and next steps to associates, vendors, customers and media. Consider your most critical processes. This will help determine where you need to devote resources, such as time, money and people. Think about each and every aspect of your business (internal- and external-facing) and make sure it’s written down in your plan. You’ll want a full list of contacts, such as vendors and media, placed in your plan for quick reference. You’ll also want to plan out possible disaster examples, action items and who from your team will handle each task. Think about the example shared earlier. If your retail shop is closed for a few days, sales could dip and you could lose customers. Will your business bounce back? Do you have a website customers could visit? Does your website have capacity for an uptick in visitors? Who will fulfill and ship orders if your shop is out of commission? You’ll have to think through both short-term and long-term scenarios. A power outage is minor compared to a flood, fire or tornado. What about a complete system or software failure? These examples are significant and last longer than a week. How will your business respond? Meet with your independent insurance agent to review your insurance policy and make sure there are no gaps in your coverage. Think of all aspects – the cost to repair or build, disruption to your business (loss of income, loss of customers), belongings and liability. Remember, most insurance policies do not cover flood damage; however, you can purchase and add this additional coverage to your existing policy. Connect with your local fire and police departments. Share floorplans and invite them to visit your office for a tour. The more familiar they are with your building, the quicker they’ll be able to assist during an emergency. It’s encouraged to review your disaster recovery plan every six months. During that time, make necessary updates to the document, specifically with any changes to associates, vendors and media. Schedule time to practice and play-out possible scenarios. Make sure those involved take these exercises seriously and know what their role is during emergencies. Not all disaster recovery plans are created equal. When you create yours, make sure it’s effective. Once yours is complete, test it out. Put together a few scenarios with your team and use your plan as your guide. Does the guide help? Does your team know what to do next? If not, fine-tune it. Determine what works best for your team when it comes to responding and reacting to a disaster and document it. If you're doing nothing to prevent accidents, the inevitable will happen. 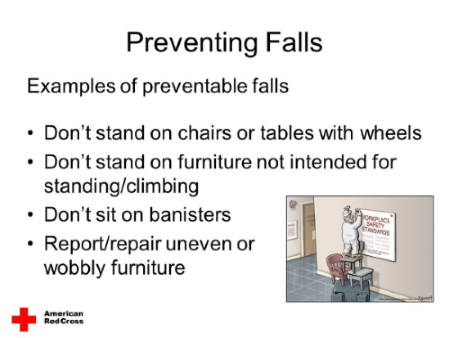 Don’t let an unnecessary serious accident happen to one of your employees. Taking the time to conduct regular safety meetings and enforcing safety procedures can reduce costly injuries and the worker's compensation claims associated with them. Maintaining a safe workplace could also lead to reduced insurance premiums for your business. Here are some tips to help you and your employees avoid some of the most common — and costly — workplace accidents. Ladders should be in good condition and examined regularly for defects. Two minutes. That’s the amount of time fire experts say that you have to escape a burning home before it’s too late to get out. According to the Red Cross, each year more than 2,500 people die and 12,600 are injured in house fires in the United States, with direct property loss estimated at $7.3 billion annually. House fires are preventable so take action and keep you and your loved ones safe by following these seven tips. 1. Smoke detectors — When’s the last time you changed the batteries in your smoke detector? Get in the habit of checking the alarm monthly and replacing the batteries twice a year. Smoke detectors should be installed in every bedroom and on all levels. Interconnected smoke alarms are available which means when one goes off, they all sound. 2. Fire escape plan — it’s important to create and practice a fire escape plan as a family. Explore alternate escape routes in case the fire is blocking the main exit. If you have small children, the National Fire Protection Association has an escape planning grid which may help them better understand what they should do and where they should go. 3. Cooking — When using your stovetop, always stay in the kitchen and if you have to leave (even for a moment) turn it off. Always stay in your house when you’re using the oven, checking it regularly. It’s also important to keep items that are flammable such as potholders and towels away from the stove. 4. Space heaters — the number of residential fires always goes up during the winter months peaking December through February mostly due to the increase in usage of space heaters. Always read and follow the directions and keep it at least three feet from anything flammable. Never place a space heater near a bed or in a spot where a child or pet could easily knock it over. 5. Candles — it’s important to never leave a lit candle unattended or allow older children to use candles unsupervised in their bedrooms. 6. 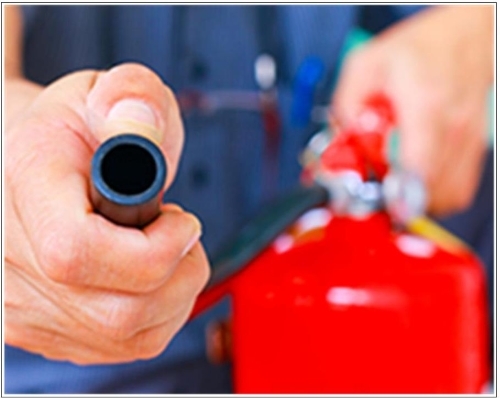 Fire extinguishers — a fire extinguisher is a good tool when a fire is contained in a small area and used after the fire department has been called. The National Fire Protection Agency says to remember PASS when using an extinguisher. 7. Teaching kids about fires — teach your kids the facts about fires so they know how to protect themselves. After the Halloween candy has dwindled to the final unwanted packet of candy corn, thoughts begin to turn to winter. Fireside chats, holiday parties, and — you guessed it — snow. Lots of snow. 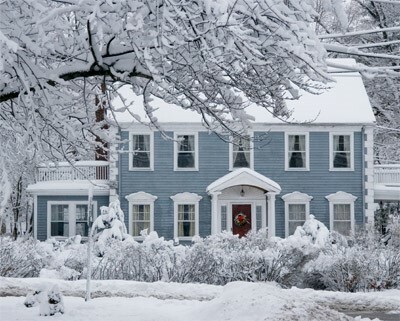 You know how to keep Jack Frost from nipping at your nose, but what about your home? Get your mind into the gutter. It’s not fun, but it’s necessary to get your hands dirty and remove the sludge that’s worked its way into your gutters and downspouts. If they’re clogged with debris, they may not function properly, which can lead to water damage, loosened gutters, ice dams, and vermin. The National Center for Healthy Housing has some great tips on how to take care of both the interior and exterior of your home in every season. Raise the roof. Not literally, but it is a good idea to give it a detailed once-over to ensure that the roof flashing is intact and your chimney’s mortar is in good shape. But between slippery surfaces and low-hanging power lines, climbing atop your roof can be really dangerous. The Occupational Safety and Health Administration (OSHA) advises using a guardrail system and wearing appropriate gear (rubber-soled shoes and a harness) before taking on the task of maintaining your roof. And if you use a roof rake, make sure you take extra precautions. Trim the trees. Errant branches can damage your roof and gutters. Cut them back. But be aware OSHA recommends that all tree trimming or removal within 10 feet of a power line be done by a professional. Go beyond the windows. Doors, vents, fans, plumbing, air conditioners, electrical and gas lines, and mail chutes can all benefit from stripping and sealing. The Insurance Institute for Business and Home Safety recommends at least inspecting them all for leaks to help increase energy efficiency. Buy your home a winter coat. Heat rises, which means that all that warm and toasty air you want to keep in the living room could be trying to escape into the attic and out through the roof. Adding to the insulation in your attic’s floor will help keep heat from taking flight in the winter months. It will also help with other common household problems like outside noise, humidity, insects, dust, and pollen. The United States Department of Energy has helpful guidelines for the what, where, when, and how of all things insulation. Prep your pipes. Better to be safe than sorry — water damage repairs can cost a fortune. Frozen pipes burst easily, so make sure to insulate all accessible pipes before it gets cold. Fortify your furnace and fireplace. Beyond a detailed inspection, it’s also important to replace or clean furnace filters once a month during the heating season. Permanent filters reduce waste and hassle, and HEPA filter can remove up at least 99.7 percent of airborne particles. And every fireplace, woodstove, or space heater should also be inspected every year. If you’re fortunate enough to head to the beach during the winter months, it’s especially important for you to pay close attention to properly winterizing your home. Take a look at how to protect your vacant dwelling — from top to bottom — so that you remain a lucky duck, not a sitting one. In the United States, emergency rooms treated 251,800 toy-related injuries, according to the report issued last year from the U.S. Consumer Product Safety Commission (CPSC). And, 44 percent of the injuries were to the head and face area, the area of the body with the most injuries. An estimated 84,400 of all toy-related injuries, or 34 percent, happened to children younger than 5 years of age. In addition, a new study published in JAMA Ophthalmology, “Epidemiology of Sports-Related Eye Injuries in the United States,” found that basketball, baseball, and air guns were the most common causes of injury, accounting for almost half of all primary sports-related eye injuries. · Avoid toys that shoot or include parts that fly off. · Ask yourself or the parent if the toy is right for the child's ability and age. Consider whether other smaller children may be in the home that may have access to the toy. · Avoid purchasing toys with sharp or rigid points, spikes, rods, or dangerous edges. · Buy toys that will withstand impact and not break into dangerous shards. · Look for the letters "ASTM." This designation means the product meets the national safety standards set by ASTM International. · Don’t give toys with small parts to young children. Young kids tend to put things in their mouths, increasing the risk of choking. If any part of a toy can fit in a toilet paper roll, the toy is not appropriate for children under the age of 3. · Do not purchase toys with long strings or cords, especially for infants and very young children as these can become wrapped around a child’s neck. · Dispose of uninflated or broken balloons immediately. · Magnets, like those found in magnetic building sets and other toys, can be extremely harmful if swallowed. Seek immediate medical attention if you suspect a child may have swallowed a magnet. · KidsHealth.org recommends that bicycles, scooters, skateboards, and inline skates should never be used without helmets that meet current safety standards and other recommended safety gear, like hand, wrist and shin guards. · Read all warnings and instructions on the box. · Always supervise children and demonstrate to them how to use their toys safely.